Scientists around the world have been trying to replace damaged heart tissue using lab-made heart-muscle cells (cardiomyocytes), either injecting them into the heart or applying patches laced with the cells. But results to date have been underwhelming. "If you make cardiomyocytes in a dish from pluripotent stem cells, they will engraft in the heart and form muscle," says William Pu, MD, director of Basic and Translational Cardiovascular Research at Boston Children's Hospital. "But the muscle doesn't work very well because the myocytes are stuck in an immature stage." How the cardiomyocytes that we start developing before birth become vigorously contracting adult heart muscle cells hasn't been well understood. "I think there are specific signaling pathways that control that process, which we haven't been able to reproduce in a dish," says Pu. Studying cardiomyocyte maturation in live mice has been equally challenging. Prior studies have tried genetically engineering mice with different genes "knocked out" in their heart muscle to figure out which ones are required. But complete loss of a gene often causes dysfunction of the entire heart, which itself can impair maturation. Moreover, breeding multiple strains of "knockout" mice with different genes deleted is an expensive, time-consuming procedure. In a new study published September 21 in Nature Communications, Pu and colleagues bypassed these hurdles. 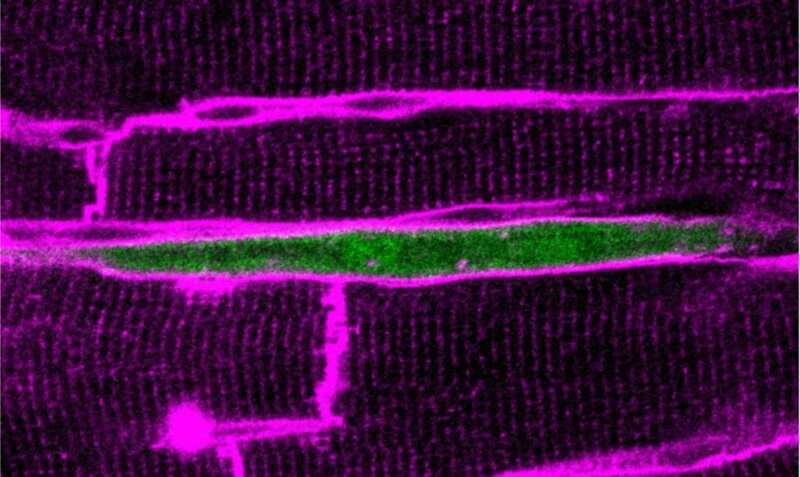 Using live mice and CRISPR/Cas9 gene editing technology, they teased out a key factor involved in heart muscle maturation in a new and novel way. "We were able to test 10 potential genes of interest within 10 weeks," says Pu. Second, rather than delete the gene in every cell, the researchers injected the virus such that roughly 1 in every 10 heart muscle cells was affected. This "mosaic" delivery pattern allowed the unaffected heart muscle to keep functioning. The team could then study the mutated heart muscle cells separately. In normal, mature myocytes, the basic contractile structures, known as sarcomeres, are highly organized. But in the mutant myocytes, the sarcomeres became disorganized. Furthermore, normal cells develop transverse tubules, important structures that help to coordinate sarcomere contraction. These too were greatly disrupted in the mutant myocytes. Finally, the mitochondria, which provide energy and are normally arrayed alongside the sarcomeres in brick-like fashion, were dramatically reduced in size and number. In further experiments, the team showed that SRF regulates the activity of multiple other genes, including critical sarcomere genes, in immature cardiomyocytes, but not in mature cardiomyocytes. They think that SRF receives signals from the rest of the cell which cue it to execute a master organization program during maturation. Finally, Pu and colleagues showed that sarcomeres themselves must be properly assembled for other aspects of maturation to occur. "We learned that sarcomeres are not just important for contraction, but are probably driving the maturation program," says Pu. Overall, the results would seem to suggest that if you could just find a way to boost SRF, you could get lab-made heart muscle cells to grow up. But it wasn't that simple: When SRF was over-expressed, the cells looked the same as those without SRF at all. And that sets up the lab's next goal. "Cells seem very sensitive to the level of SRF," says Pu. "You probably can't manipulate SRF itself. You have to understand what's controlling it upstream." Yuxuan Guo of the Department of Cardiology at Boston Children's Hospital was first author on the paper. Funders included the National Health Lung and Blood Institute, the American Heart Association and the Boston Children's Hospital Department of Cardiology. See the paper for a full list of authors and funders.